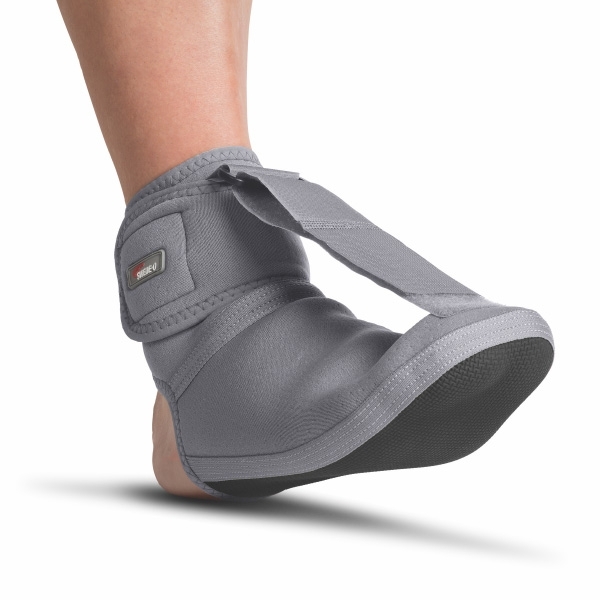 Fight plantar fasciitis in comfort. The breathable, thermal properties of this dorsiflexion device make it easy to wear while stretching the plantar fascia to promote healing. The Plantar DR has a strap that pulls toes upward and places the foot in a dorsiflexion position. This helps stretch the plantar fascia and aid in recovery of plantar fasciitis. The thermal compression properties retain your natural body heat and reduce swelling in order to lessen pain and promote quicker recovery. Comfortable design features include a soft, breathable membrane for free flow of air, allowing the skin to remain well ventilated. It is also lightweight and more portable than bulky night splints. The Plantar DR is designed to complement other methods of treatment and work to overcome injury caused by trauma or overuse more quickly. It helps make tendons and muscles more elastic and allows them to become more responsive to therapy and exercise. Ideal for runners or athletes who struggle with plantar fasciitis, or anyone searching for therapeutic relief from foot pain associated with plantar fasciitis. The Plantar DR is sold singly – one boot per order. Choose from four size options (see sizing chart) in dropdown menu. *Not an ambulatory device; do not wear while walking. Care instructions: Hand wash in warm water using mild soap. Drip dry. Do not wring, twist, tumble dry, bleach or dry in direct sunlight.